The search for a site for the oceanarium ended on a wave-tossed sandspit along coastal highway highway A1A, eighteen miles south of St, Augustine, Florida. Immediately to the east was the ocean, to the west was the inland waterway and to the north historic Matanzas Inlet. 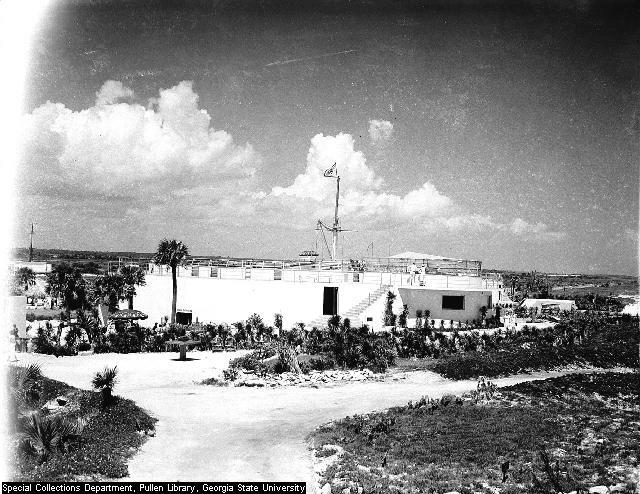 Construction began in 1937 , one hundred and fifty tons of steel, arriving on barges, were unloaded on the inland waterway to the boat basin within a few hundred feet of the foundation of the oceanarium. Presently a network of steel arose above the foundation and the two vast tanks, three stories high, began to show their symmetry. The rectangular tank was 100 feet long , 40 feet wide, and 18 deep, and the circular one 75 feet in diameter and 11 feet deep, Connected by a large flume, the two tanks were surrounded by passageways with windows assuring wide-angle visibility both to the eyes and to the motion picture camera. The most critical features of the installation were under the heavy floors and the two tanks and adjacent to them in separate buildings. Here were assembled the thousands of feet of pipe of all sizes, and the valves, pumps and motors necessary to circulate between four and five million gallons of sea water through the tanks every day. A stand-by unit was prepared to generate electricity for the pumps in the event that power lines failed. The final weeks of construction in the spring of 1938 were followed by a hectic interval for finishing touches. In order that the rectangular tank might be made more hospitable for the fish and more realistic to the observer, eight tons of rock were hoisted over its walls. Arriving from Key West in February, seven tons of coral were also arranged on the floor of the tanks on order that the highly colored tropical fish might find safety from their enemies just as they normally do in the open sea by escaping among the interstices of the coral growth where the larger carnivores cannot follow.